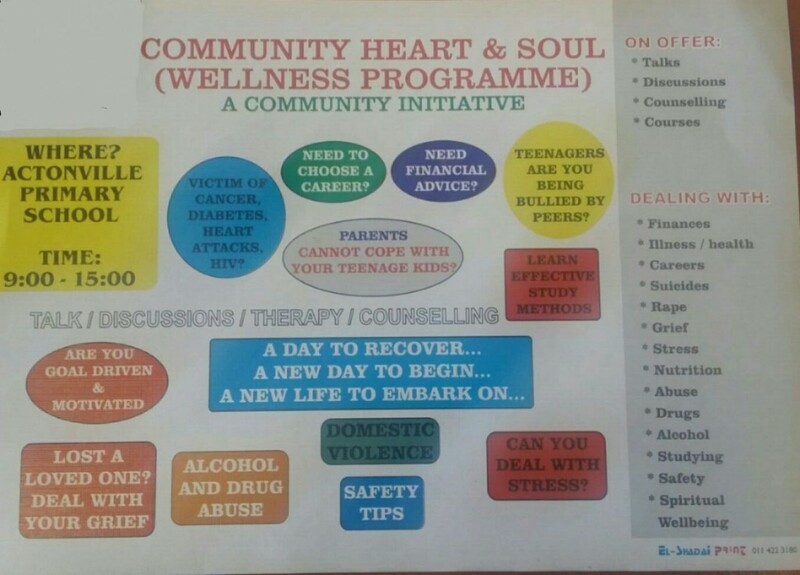 COMMUNITY HEART N SOUL is an initiative we wish to undertake in the community of Actonville. The standard of living has deteriorated n some socio economic problems have escalated resulting in a diminished quality of life. Yet the stalwarts of the same community have produced professionals n skilled workers over the years through its schooling in and among the 5 schools in Actonville. This project will be undertaken for a day. 19 Sept 2015. 8.30 to 15.00. All classrooms will be utilised for Therapists, Counsellors n Talks. The entire community will be invited as well as secondary school learners. The topics warrant individual n group sessions which will be ongoing. Blood bank camps n centres to allow for pressure checks etc will be arranged. We urge you as individuals n community organisations to invest your skills n talents in this one day programme. I met my parent population today n there was a fervent call to help uplift the community. All visitors will receive a fruit n juice or biscuits after a visit. Therapist n community volunteers wil have a tea break n a lunch break n sponsors will be sought for these refreshments. Help make a difference to “Build a Nation”.